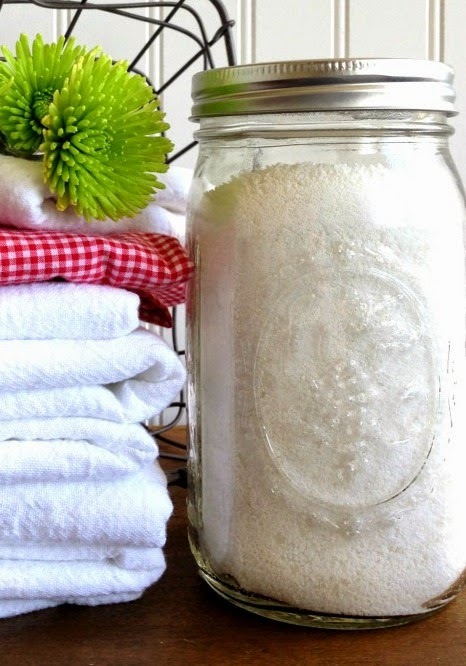 Homemade LAUNDRY detergent: Discover the amazing cleaning power of this non-toxic, Borax-free recipe! Ever wonder why so many people make their own laundry detergent these days? Maybe there really are hidden toxins we should be concerned about in commercial laundry soaps. There really can be nasty things lurking in the products we've come to trust. That's because manufacturers are not required to list all the chemicals that go into their laundry and cleaning products. In fact, even products labeled "safe" and "environmentally responsible" and "green" and "natural" can contain compounds that are in reality very far from safe, responsible, green or natural. With laundry, we get exposed to toxins in more ways than one. Through our skin when we wear and use items washed and dried with toxin-containing products. And also from the air when we breathe toxins released from artificial fragrances and chemical residues left on laundry. But what about Borax? 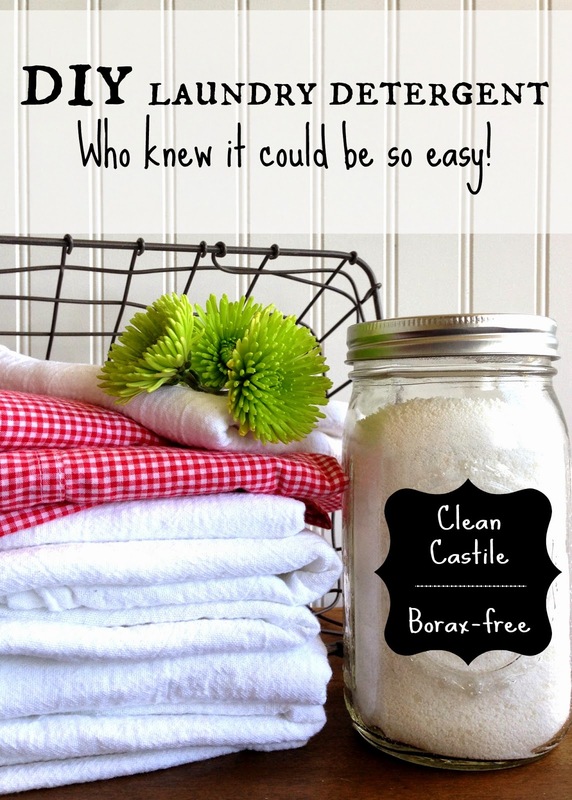 You make your own laundry detergent with Borax, so you're good, right? Borax is a long-standing ingredient to homemade laundry detergent, as well as many other cleaning and personal care products. The internet is jam-packed with recipes that call for this "natural" ingredient. Borax is safe, right? Well...research suggests even Borax may not be as safe and non-toxic as we once thought. (Learn more here). Is there a truly safe, non-toxic, yet effective DIY laundry detergent recipe out there? The answer is, Yes! And I'm going to tell you about it. The beauty of this recipe is that it's completely non-toxic, with most of it's ingredients being food grade. Yet, it works beautifully to clean your laundry. And the best part is, making this laundry detergent isn't hard. In fact, you may be surprised how easy it is! *See note in the chart below as why this is the only oxygen cleaner considered safe enough to be recommended here. **Normally, you wouldn't mix washing soda with citric acid, because when combined with water they can neutralize each other much like the reaction between vinegar and baking soda. However, you can maintain a proper pH with the right ratio of acid to alkaline base. That ratio is 1 part citric acid to at least 4 parts washing soda. With the added baking soda in this recipe, there's plenty of alkalinity to keep things balanced so your laundry gets clean. ***Click HERE for information on what company I buy my essential oils from. If you're curious about buying these oils at wholesale prices, click HERE. If you'd like to talk to me personally about any questions you have regarding getting these oils, click HERE to send me an email. **** It's a good idea to have a food processor that's dedicated to only soap and laundry detergent making, not shared with food preparation. (An inexpensive, basic model like the one linked above is what I use, and it's performed really well in keeping up with my laundry soap making over the past year). Purpose: Cleanser. Castile soap contains coconut oil, which is an amazing yet mild cleaner. What is it? A pure, bio-degradable soap made with coconut oil and olive oil. It contains no artificial foaming agents, harsh cleaners or animal fat. Is it safe? Yes! It's even safe for septic tanks, because it contains no animal fat. Purpose: Color stabilizer. Sea salt helps prevent fading and acts as a fabric softener. What is it? Salt from the sea. Is it safe? You bet! (Safe enough to eat, even). Purpose: Cleanser and water softener. Soft water helps prevent the dingy mineral build-up that occurs from hard water. What is it? Sodium carbonate. This is a food additive used as an acidity regulator, anti-caking agent, rising agent, and stabilizer. Is it safe? Darn tootin'! Purpose: Stain remover and odor remover. What is it? Sodium bicarbonate. Another food additive, used in baking as a rising agent. Purpose: Water softener for brighter colors and whiter whites. What is it? A crystalline acid present in lemons and sour fruit. Is is safe? Two thumbs up! What is it? Sodium carbonate peroxide and sodium carbonate (powdered hydrogen peroxide). It releases oxygen when water is added. It's made from treating baking soda with hydrogen peroxide. Is it safe? Yes. This product scored an A by the EPG (Environmental Work Group). Only the Baby variety is recommended here, as it contains only two ingredients that are both eco-friendly, and no other ingredients. (Other OxiClean products may contain ingredients with higher risk factors, and are therefore not recommended). What is it? All natural fragrant plant-based oil. Is it safe? Absolutely (just make sure it's pure therapeutic grade you're good to go). STEP 1: Using a food processor, grate 1 bar of castile soap. when you grind everything together. STEP 2: Now measure all the other dry ingredients into a separate bowl and mix together with a fork. Stir slowly, so you don't create a cloud a dust. This mixing will help the castile soap not clump when you grind it together with everything else. Once the soap is mixed with the dry ingredients, attach the grinding blade in the food processor. Carefully pour the mix back into the processor bowl and put the lid on. one dropper of your chosen essential oil. Store your laundry detergent in a wide-mouth, quart-size mason jar, or another air-tight container. Use 1 to 2 tablespoons per load, depending on how soiled your laundry is. Want a fun way to label your laundry detergent? Try these premium chalkboard labels. They stay put on your jars and come with a liquid chalk marker that smudge-proof, but can easily wiped off for re-labeling. I use these and love them. "Farm Girl: it's a verb, because it's what you do." inbox! CLICK HERE to subscribe! Disclosure: This post contains affiliate links. That means if you click through and make a purchase, we receive a small percentage in commissions from the company you buy from. We value you as a reader and want you to know that the products we link to are only products we use ourselves or that we feel will add value to your life. Thank you for supporting Farm Girl Inspirations! To read our full disclosure statement click here. DIY Electric DISHWASHER DETERGENT that makes glassware sparkle. Finally! DIY WINDOW CLEANER that cleans like magic. DIY LAUNDRY TRICKS: Safe, all-natural ways to soften and freshen laundry. DIY Glass SPRAY BOTTLES to safely store homemade cleaners. I've used your recipe for laundry detergent and it's awesome. I've been using the 1-2 Tbls per load, as you suggested. It's awesome to cut out some chemicals and still have clean clothes! Thank you for posting this great tutorial! love this recipe that is borax-free. Nice pictures too. That is the one I make and found a cookie jar that is on an ankle w/ lid to scoop out. I got it from the Container Store. I love the mason jar too. Thanks for your comment :-) The angled cookie jar sounds like a good way to store your laundry soap. Nice tip. Very helpful post! I will try it for sure! I love homemade cleaners! Thanks, Hayley. Me too! I've found I can save a lot of money by making my own cleaners. Thanks for dropping by. Made more with my friend today. We used sweet orange, lemon, and cinnamon essential oils. Wow! Way cool combo. I bet it smells yummy! It was. I made more tonight and this time I used Thieves, Orange, Blue Spruce, and Cinnamon Essential Oils. I also forgot to tell you I bought Oxo-Brite which is the Earth Friendly Products brand for that part of the recipe. I'm guessing it will still work if you don't completely grind up everything together, right? Hello! Can I use iodized sea salt (already in my cupboard) or must it be coarse sea salt without iodine? Does the iodine affect the recipe or results? Thanks for the reply! And thanks for this great article. The recipe itself is great, but the research you put into this saves so much time and worry for the rest of us. Greatly appreciated! Can you use a different kind of soap? Allergic to coconut. Hi. Other soaps people use to make laundry soap are Ivory and Fels-Napa. I don't know how these will perform, as I always use castile soap because it's a very good cleaner. You should be able to substitute a different kind without a problem, just make sure it's not super-fatted as the moisturizers and oils in this type of soap wouldn't be good for cleaning laundry. (Super-fatted soaps are often made to be used on the face). Hope that answers your question. Could these ingredients be combined with hot water to make a liquid version of the detergent? Leaving out the Oxi-Clean & just adding that separately into the machine (since it is water-activated)? Has anyone tried this? Thanks! Hi! I haven't yet made a liquid laundry soap, but I've read about doing it, and I think you would heat the bar soap and water, then add the other ingredients and cook. (That's not a full run-down). Here's the important thing to consider: If I was going to try this as a liquid soap, I would leave out the citric acid. When the washing soda, baking soda and citric acid are combined with water, a fizzy reaction occurs, much like vinegar and baking soda. This works in the dry mix because the reaction happens in the washer when the water is added, which can help break up dirt, etc. But in a liquid soap solution, the two elements (soda and citric acid) neutralize each other and become less effective. So, long story short, I think your idea is possible, but without the citric acid. Hope that makes sense. Hi, can anyone confirm if this is safe to use in HE high efficiency machines? Hi Deedee! We have a HE machine and this soap works great in it! Hey what a brilliant idea to make home-made laundary detergent I have come across and believe me I have been searching out for this similar kind of post for past a week and hardly came across this. Thank you very much and will look for more postings from you. I have just tried your recipe and can't believe how effective it is! It is very strange that something so easy to make can clean so well! Even more - the smell is pretty good as well. I have read your article very attentively really this is very informative article. I have a top loader washer. Do i still only use the 1 to 2 tablespoon? Always been confused on this i thought you used 1 to 2 tbs if you have HE washer or a front loader. Thanks for your time. I going to make this tonight to try on my husband work clothes. I alreadt make liquid form but with few diff ingredients. But i need something stronger to clean his clothes he works in a factory so clothes are black and greasy like. Would your recipe be safe to also include colo safe bleech just for extra boost of stain lifter? Obviously, the most frugal option is to make your own, but these natural alternatives are a good choice if you aren’t able to make your own or don’t want to. I admire this article for the well-researched content and excellent wording. I got so involved in this material that I couldn’t stop reading. I am impressed with your work and skill. Thank you so much. Amazing Article :) Im extremely affected by your blog.I’m happy that you simply shared this useful info with us.I am quite sure I’ll learn many new stuff right here! DIY all-natural TOOTHPASTE so good, you can brush aside the store-bought stuff and never miss it! Best DIY ROLL-ON DEODORANT (works like crazy)! Stop the stink for up to 48 hours, no joke. 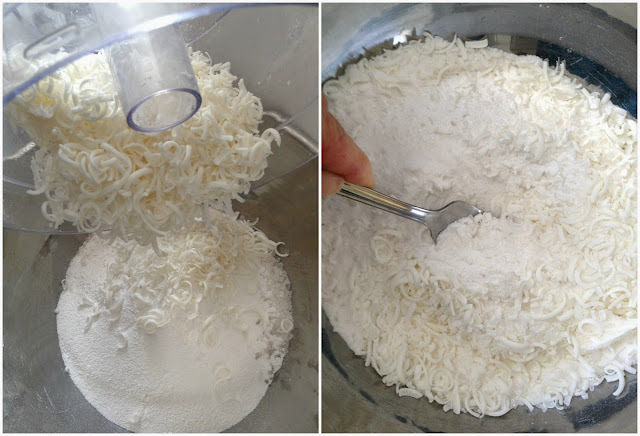 Easy DIY CREAMY SHAVING SOAP. (Wow! Only two ingredients plus water)! Homemade COUNTRY GRAVY MIX: The frugal farm girl's DIY ready-made mix series. 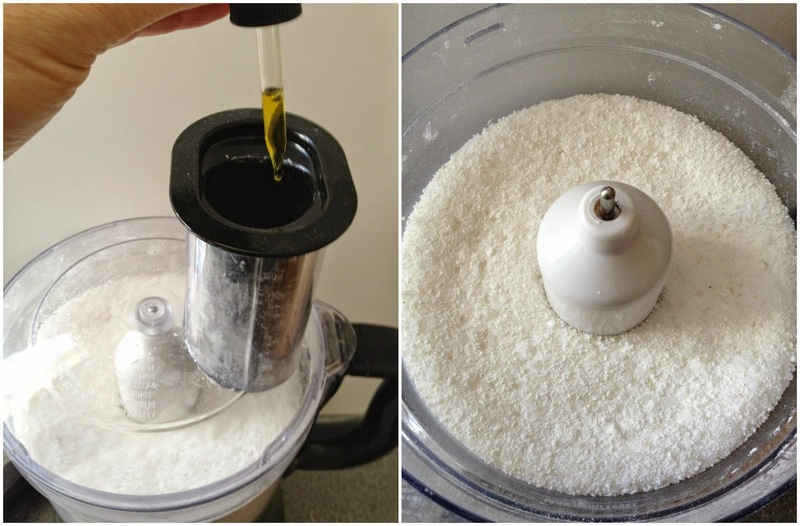 Homemade DISHWASHER DETERGENT that works like a charm! (Non-toxic, Borax-free recipe). How to train a rooster to be nice (or at least to stop attacking you). DIY LAVENDER FIZZY BATH SALTS: Nature's perfect remedy for much more than sore muscles. Homemade COUNTRY BISCUIT MIX: The frugal farm girl's DIY ready-made mix series. 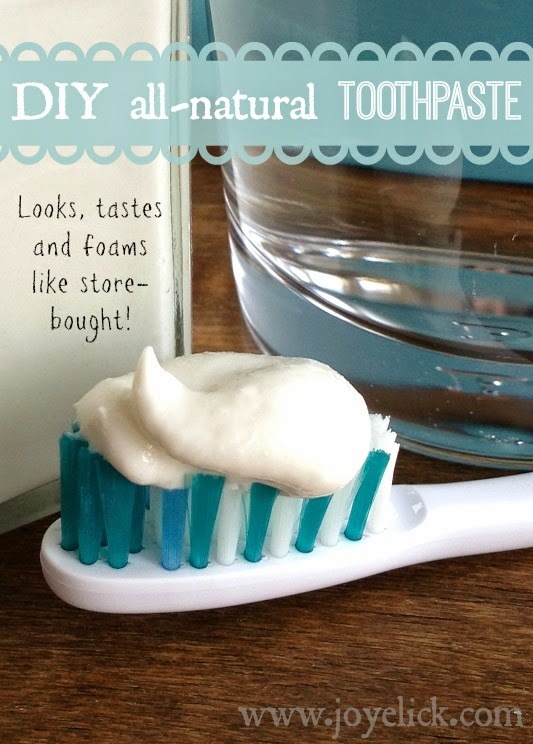 Homemade TOOTHPASTE recipe so good, you can brush aside the store-bought stuff and never miss it! CORNBREAD MIX: The frugal farm girl's DIY ready-made mix series. COUNTRY BISCUIT MIX: The frugal farm girl's DIY ready-made mix series. How to make BEEF JERKY the easy way! How to make GRANOLA (With free-style chart for endless variety). MUFFIN MIX (With free-style chart): The frugal farm girl's DIY ready-made mix series. NO-KNEAD BREAD MIX: The frugal farm girl's DIY ready made mix series. 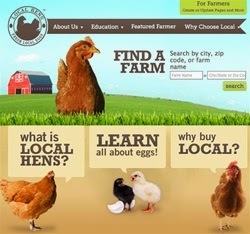 Buy Local: Find Farms in Your Area! (It's FREE). Find me on Girl Gab with my farm girl sisters. Find out about Mary Jane's Farmgirl Sisterhood. Copyright 2013--2017 M.J. Elick. All rights reserved. . Powered by Blogger.